I’ve been giving the Firefox Focus browser app a try on my iPhone to have a more private experience while browsing the web. Hopefully, I’ll see less ads (which are always blocked) and the sites will load quicker. Transmit is my favorite utility for FTP and connecting to other cloud accounts and today Transmit 5 make things so much nicer! I checked my personal email for the first time since Saturday this evening. My inbox was full with nearly 200 messages, but nothing was urgent and only needed to send a few replies. Plus I was able to process them all in about 30 minutes. How often do you check email? Since returning back to work from paternity leave, I’ve found it hard to concentrate for long periods of time. It seems like there is so much going and my mind goes in a zillion directions. Today, I started reading Deep Work by Cal Newport in hopes of learning some techniques to exercise my brain muscles so I can concentrate better. 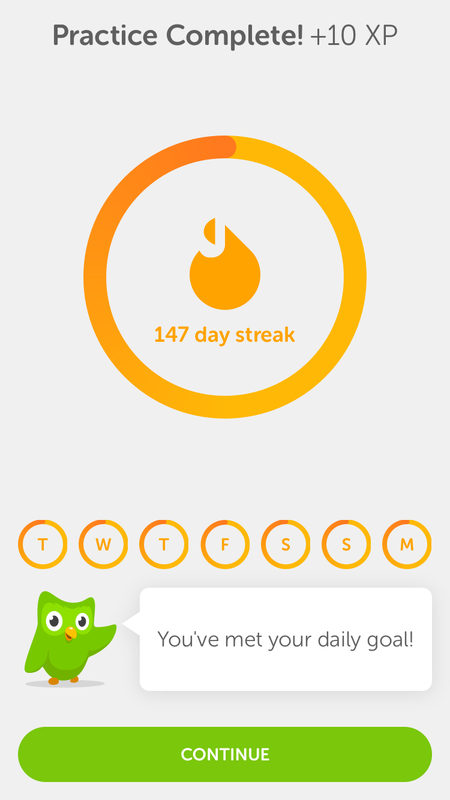 Today is the 147th day in a row that I’ve completed Spanish exercises in the DuoLingo app. I’ve been listening to podcast since 2007 when I had an hour-long commute to my corporate job at Whirlpool. Upon graduation, I bought my first iPod; a 30GB video click wheel model. Since I had a long drive, 5 days a week, I would load up on financial podcasts (like the Dave Ramsey Show) and Mac podcasts (Mac OS Ken and MacBreak Weekly to name a few). It thrilled me that my shows would download to my computer overnight and once I plugged in the iPod to my computer, all the content would sync. I’d then use my 3.5mm jack to cassette adapter to listen to my shows in the car. After awhile, I enjoyed the drive more than my job as I was inspired by content I was listening to. Back then, you didn’t see many people walking around with ear buds in their ears. So I only listened to shows while in the car. That was 10 years ago. I started my day as I have the last few weeks, by holding our 4 week old son so my wife could get a few more minutes of sleep (he’s a noisy sleeper, ha!). I put in one of the AirPods and listened to a few short shows as I sat in silence. After I dropped my daughter off at school, I plugged my phone into the AUX port in the car and listened to a show while I navigated to the library while I worked while she was at school. I set up shop and connected my AirPods to my computer. While I was doing some brain-power-free items on my task list, I used the PodcastMenu app to list to shows saved in Overcast. Later this afternoon, I again used the AirPods while pulling some weeds / mowing the grass. The mundane work is much more in enjoyable with an inspiring podcast. Lastly, I got the baby to sleep around dinner time (with again, one AirPod in) and was listening to a show, but oh no! My phone was much too far for me to reach and I didn’t want to risk waking the baby to move to a new show. Since I have an Overcast app on my watch, I was able to gently move my hands together and queue up another show. The star of this whole show is the Apple AirPods. It’s so handy to listen with only one earbud in (so I can hear other things) and not have any wires anywhere. A few days ago I posted about buying a new reel mower for our grass. This wasn’t the optimal solution. If the grass was too long, the mower didn’t work right and my old battery powered Ryobi mower wasn’t holding a charge long enough to mow my whole yard. After a bit of research, I found that the EGO brand to have the best battery technology on the market, so of course, I had to have one. On Sunday, I stopped by Home Depot to see if the in person version was as impressive as the reviews were online. Turns out the reviews were right. EGO has a handful of battery powered outdoor tools and there was a deal on that day to get a leaf blower for $100 off. This included a battery that could also be used on the mower. I picked up the 21″ self-propelled mower and put it thru the test today. My goal: mow the whole yard in under an hour. The self propelled mower has a throttle control and I set it to rabbit speed and took off. I got thru 90% of the yard before the battery died. I used the smaller leaf blower battery to finish off the yard. The whole yard was done in 40 minutes. Fastest I’ve ever finished completely mowing the yard. Then I trimmed and cleaned up with the leaf blower and was done in under an hour. The gear is expensive, but it has the power of the gas powered equivalents. I got an email today from Text Expander that last month I saved four hours of typing by using short snippets that expand on my Mac. Most of the snippets are for replies at work, but some are for personal. Four years ago, I got really excited about building / having a standing desk. Over the next few days, I’ll share pictures of me building the desk I still use today. This post is part of a series describing what Automatticians do on a daily basis. You can read more posts like this by following the tag #a8cday on WordPress.com and Twitter. Here’s a look in at my “typical” day, even though every day changes, due to my wife’s work schedule and/or three year old daughter’s schedule. Today is a bit different as I have to take my daughter to her Spanish Immersion preshool. 04:25 – Alarm goes off and I’ve got to get ready for the gym. Due to today’s schedule, the only time I’ll be able to get to Bomber’s Crossfit is at the 5am class. 05:55 – Workout over and I recorded two Personal Records (PRs) for the day, score! 06:45 – Podcast is recorded and published, time for a shower and get ready for the day. 07:30 – Shouts from our daughter come from an upstairs bedroom, she’s awake and ready to get up. For the next hour, she has breakfast and I unload dishwasher / pack her lunch and pack my computer up to head out of the house. 08:35 – We’re on the road towards school. It’s 22 minutes away and we are set for an on-time arrival. A majority of my colleagues live in different states / countries and there is a lot that has happened since I was done with work yesterday afternoon. I share my comments on a few internal discussion threads and reply to any outstanding messages in Slack. I read a few colleague’s #a8cday posts and remember I want to write one too. Some days during this three hour window, I’ll work on tickets to our customers. Today, I’m focusing on everything that isn’t ticket work. This includes picking items form my todo list that are critical to be finished today and following up on some bug requests. 11:50 – I’m packed up and heading back to pick my daughter up from school. 13:00 – Back in my home office ready to go. Our nanny was at our house when we arrived, so my daughter began playing with her. My legs are sore from yesterday’s / this morning’s workout, so I opted for my standing desk. I open up our ticket queue, hit the play button, started my music with Brain.FM and begin to help our customers one random request at a time. The first few are about configurating their shipping modules, then a few about products like Cart Add Ons and coupons not working right. My usual goal is to get thru 10 tickets in an hour, which is super challenging since some of them can take 30 minutes to debug. My first hour I got thru 3. Hour #2 was much more fruitful, as I made it thru 11 tickets. The topics ranged from setting up taxes, to verify my theme is working properly, to asking customers to deactivate all plugins except for WooCommerce to check for plugin conflicts. Every ticket is a new challenge. Most of time, it’s for one of the 400 extensions I’ve never installed, so I have to install the plugin, read the documentation, then try to configure it. Then I have to determine whether or not the behavior is intended, or if it’s a bug. 16:10 – Almost a wrap for the day. Scan thru and delete files from my desktop (screenshots) and downloads folder (misc work files). Close down Slack, Brain.FM, move any action items from open browser tabs to OmniFocus, then close both Chrome and Safari. 16:30 – Done with work for the day. Monday’s and Wednesday’s are normally a bit lighter on ticket work as I try really hard to get all the rest of my tasks done for the week on these days. Then I spend the rest of my working week heads down working on tickets. My goal is to have 150 interactions with customers a week. Some weeks I can hit my goal in during the work week. Other weeks, like this one, I’ll spend less tickets each day, but then spend a few hours on Saturday morning responding to tickets before my family wakes up. Does this sound like a work day would be perfect for you? Work with us! Well, my part of them anyways. I sent everything off to our tax professionals this morning. Such a great feeling knowing that item is off my to do list before our baby comes. To see how much we owe. Today I learned of a neat little menu bar app that will allow you to play podcasts from Overcast on your Mac. And Overcast syncs my location in the episode, so I can start listening on my phone and continue on my computer, way cool! I enjoy finding Mac apps that help me stay more organized and Franz is the perfect app for that. A friend of mine pointed out this app at WordCamp Cincinnati and I’ve been using ever since (mid October). Essentially Franz is a website wrapper where you can run multiple messaging apps like Slack, Facebook Messenger, GroupMe, Skype and more all from one window. In January, I set out on an initiative to get rid of excess stuff in my life. I think I heard this on the Minimalist podcast, but the premise is to remove items that have no use or bring you no joy from your life. So on January 1st, I found a useless trinket in my office and pitched it. Then, the next day, I found two things and the day after three things. Each day, I found items to remove from my life. I was successful except for the last two days. I ran out of time to find 30 and 31 items to get rid of for those last two days in January. My plan is to continue simplifying my life in February and see if I can eliminate another 400+ items. Hard to believe January has come and gone and we are one month into 2017. This year sure is flying. January has been a really productive month for me and I continue to rely on OmniFocus to let me know what I should be doing each day. Since I’ve added my habits and rituals, I’m pleased to say, that everything I started to do on January 1st, I’ve kept up (well mostly). The one challenge that I’ve fell a bit short on is the #100DaysOfCode challenge. Last weekend, I was a single parent since my wife was traveling and had to wrangle my daughter. Each day I spent some time programming, but definitely no a full hour. My main perspective in OmniFocus is called the Dashboard and this is where I spend 95% of my time in the app. It’s a list view of everything that is available and flagged or due soon. It also contains my daily GTD tasks and daily routine things (like publishing a blog post). The system works well for me and I try to keep the number items on my dashboard to one page without scrolling, or about 25 items. There’s four ways that I get tasks into OmniFocus. The Omni Group gives each OmniFocus account a private email address that you can send messages to get a task in your Inbox. I’ll do this by forwarding to the OmniFocus task I created in Gmail. The great thing about this that the body of the email appears in the notes section of the task and it provides me a link back to the email message. From anywhere on my computer, I can hit control-option-space (which is a keyboard combination I defined) and a small window appears and I can enter just the task, or I can enter the task, assign it to a project, set a due date and more. Typically, I just enter the task and move to the correct project later. This is another defined keyboard shortcut, and this one will take any highlighted text and turn it into a task. It’s really useful when you want to save a URL for use later. The last way to add items to OmniFocus is with a combination of Siri / Reminders. If I tell Siri to “Remind me to…” it will add to my built in Reminders app, but also push it into OmniFocus. It’s extremely useful when driving or if I want to set a reminde on my watch. Yesterday I mentioned the one of the main reasons I like OmniFocus is because of the custom Perspectives. Think of these as filters to see the available tasks. This is where all of my task go when I enter them into OmniFocus. I’m bad at assigning details as I enter the project, so at least once per day I clear out the inbox and make sure all projects fit into a project and are assigned a context. Here’s where I spend most of my time. This is a perspective that shows all of my Due or Flagged tasks. I decide on these the night before by going through my contexts and flagging the items that need to get done the next day. Later in the week, I’ll explain how I have this set up. There are some tasks that need to be done repeatedly in order to keep your world stable. It can be little things like check tire presser, change furance air filter, update budget, etc… I have these in a Single Actions list and use a custom perspective to make them easy to find. I try to clear this list every week. Here I can quickly see a list of all of my projects. I use this view regularly when I am looking for tasks to work on. I rarely use this perspective. I probably wouldn’t miss it if I removed it, but a handful of times per month I’ll look for something to work on based on the assigned context. This is a combination view that combines Due / Due Soon / Calendar items. I typically check this once a day to see what is upcoming and due soon. My goal is to review all projects once per week (typcially Fridays). Each week I look at all of my outstanding projects and tasks and see what’s still relevent and what I should delete. I’ve been an OmniFocus user since 2014. I frequently refer to it as my brain as it remembers all the things I have to do. Right out of the box, it’s easy to add your tasks to OmniFocus. You don’t need to know the ins and outs of David Allen’s Getting Things Done book, you can simply create a list of items to work on and check the boxes when they are complete. One of the features that sets OmniFocus apart from all other todo list app is the Perspective features. It’s my favorite feature and I haven’t seen any other app have anything close to this. If you’re unfamiliar with Perspectives – think of them as shortcuts to specific projects, lists and particular pieces of information. Think of Perspectives as your personal assistant. You simply ask “what do I need to do today” or “what should I be working on?” and Perspectives will show you exactly that. I’ll share my custom Perspectives in another post this week. In today’s multiple device world, it’s best to always have your list with you. You want to have access to your todos, lists and projects anywhere, anytime and you need cloud sync for that. I routinely find myself using spare pockets of time in my day to check what other things I need to do and evaluate my day. Another feature of OmniFocus is the Forecast view. This is where your todos and calendar items are shown on one screen, so you know right away how busy you are today and the rest of the week. Any app that has lots of built in keyboard shortcuts is a good application for me. I try my best not to use the mouse whenever possible and with OmniFocus I can quickly add tasks to my inbox by hitting control-option-space. And inside of OmniFocus I can navigate around my different views with shortcuts as well. There’s a hefty price tag to get into the OmniFocus ecosphere as both apps (MacOS and iOS) have premium prices, but well worth it in my opinion. This week I’m going to be sharing how I use my to do list app OmniFocus. It’s basically my brain as I put everything that I need to do in this little app. I love how it syncs with all my devices and I can even tell Siri to remind me to do something and it will end up in OmniFocus. I think OmniFocus is a great tool to stay organized and it’s just that, a tool. There are hundreds of other applications out there that do the same basic thing: capture ideas / tasks that need to be done in the future. Some of the things that I’ll share are specific to OmniFocus, but others can be use in any to do list application. Stay tuned for tomorrow for a week of productivity on Dustin.Blog. I haven’t set many goals for this year, as I know life will turn all kinds of crazy in about 60 days with a newborn and three year old, but I have spent a bit of time adding new rituals/habits to my daily life. So far, I’ve finished all of these all 20 days of the year. I can’t say for certain I’m getting much better in any one of them, but come December 31st, I’m sure I’ll see huge progress. The image shows a few books coming up on my reading list. In September 2015, at our Grand Meetup, I started to teach myself how to type with an alternative keyboard layout called Dvorak. Dvorak proponents claim the Dvorak layout uses less finger motion and reduces errors compared to the standard QWERTY keyboard. This reduction in finger distance traveled is claimed to permit faster rates of typing while reducing repetitive strain injuries, though this has been called into question and their criticism has in turn also been called into question. I started with a few weeks of typing drills to help me understand where all the letters were located. During this time, I’d immediately switch back to QWERTY once my drills were done so I could function on the computer. After about two weeks of this, I started to do my regular work (which involves a lot of typing) in Dvorak. It was really slow going at an average of 17 words per minute. I’d start the day using Dvorak and then after lunch switch back to the familiar layout so I could actually get some work done. Eventually, I bit the bullet and started using Dvorak full time. When I finally got up to 40 WPM (after at least a month), I felt like I was really flying. I used this typing speed site, to practice and gauge if I was getting any faster. Now, about 18 months later, I’m a bit faster than I was a QWERTY, averaging between 60-70 WPM and work on drills each week to become more efficient. The hardest part that I found is the muscle memory for short words and keyboard shortcuts for copying/pasting/saving/etc. I can typically consume content much faster than real-times speed, so I have a Chrome extension that allows me to speed up all videos. It’s called Video Speed Controller. I have it set on 1.5 speed by default, but normally bump it up to 2 or 2.5 depending on the type of video. And if the plugin doesn’t work for a certain type of player, I normally download it to my computer and watch it with Elmedia Player, as that also has controls to speed up playback. I enjoy reading and I set an ambitious goal of reading 50 books last year. Well, I didn’t reach 50, but I did read 22. The week between Christmas and New Years is my favorite time of year to clear out inboxes, messages, todos, and get ready for a reset. My brain likes to focus on starting new habits at the first of the year, so I’m prepping myself for some new habits in 2017. I’ve been super bad at responding to personal emails over the last 12 months. Over the last six weeks, I’ve spent time unsubscribing to email newsletters to get rid of the clutter coming into my life. My goal in 2017, is to check my email at most a few times a day and empty it out daily and unsubscribe from messages that clutter up my inbox. This was a habit that I started in 2015 and I kept it up regularly, then fell off the bandwagon because I didn’t leave a buffer window at the end of my work day. My goal in 2017, is to close all applications and browser tabs at the end of the day. This will allow me to focus on my most important task when I get to my computer and not be distracted by all the windows that I left open from the day before. I use OmniFocus for my todo list and have a custom perspective called my Dashboard (I’ll have to write more on this later). The Dashboard has my daily GTD (getting things done) tasks, some daily rituals, and the important things I need to accomplish each day. The Dashboard should only display the items that I need to accomplish that day. Right now, that perspective is showing 36 items; way more than I’m going to finish today. My goal in 2017, is to set realistic expectations of things I will accomplish and be able to tackle all of the items in my Dashboard each day.